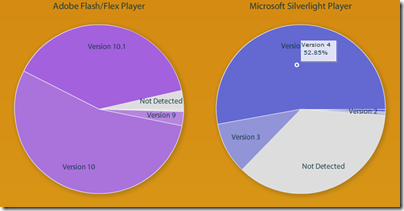 Microsoft’s Visual Studio LightSwitch is an innovative development tool that lets you build multi-tier database applications without ever designing the user interface directly. Instead, you work with defining the database and the the features you want on your screens. LightSwitch generates the user interface for you. You can also add code snippets, and advanced developers can create custom controls and extensions. The thinking behind LightSwitch was to make it easy for non-developers to create database applications, though it is not the most intuitive of tools and in reality it is developers looking for rapid application development who are most likely to use it. There is a lot to like in the way it is designed, like the data-first approach and the easy to use database designer, but this is spoilt by some odd decisions. One is that the LightSwitch team are seemingly averse to reference documentation, preferring to deliver various how-to walkthroughs, which is frustrating if you want to find out in detail how it is meant to work. 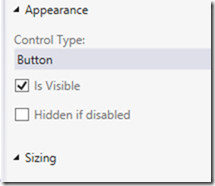 The initial release of LightSwitch, as well as the new edition in Visual Studio 2012, generates only a Silverlight client, making it useless for mobile devices and somewhat annoying on desktop PCs since you have to install the Silverlight runtime. 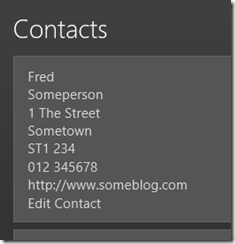 Microsoft has addressed this by creating an HTML client update, which lets you generate an HTML user interface. This is now at Preview two, and I downloaded it to have a look. We are not expanding the HTML client’s scenario target to include desktop in our first formal release. 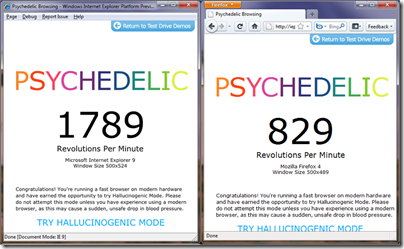 The first release will be based exclusively on JQueryMobile and be optimized for building touch-oriented apps. We’ll stay tuned to your feedback to sort out where/when we go after that, but we still have some issues to sort out for our mobile story and we’ll remained focused until we feel confident that we have a viable mobile offering. Of course it is still HTML, and will run on modern desktop browsers, though the generated user interface uses JQuery Mobile extensively. Another of the issues here is that HTML 5 may be better supported on smartphones running WebKit-based browsers than on desktops such as Windows XP running Internet Explorer 8, creating problems for LightSwitch. It is also hard to create a user interface that is equally well suited to touch control as to keyboard/mouse interaction; this issue is a common complaint about Windows Store apps on Windows 8. 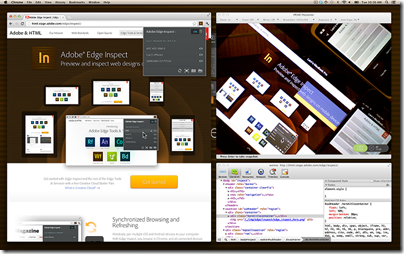 The HTML client is still interesting, more so than the original LightSwitch with its Silverlight web or desktop clients. Rapid database app development for mobile devices is an key area, as businesses work to enable their mobile users to access company data. 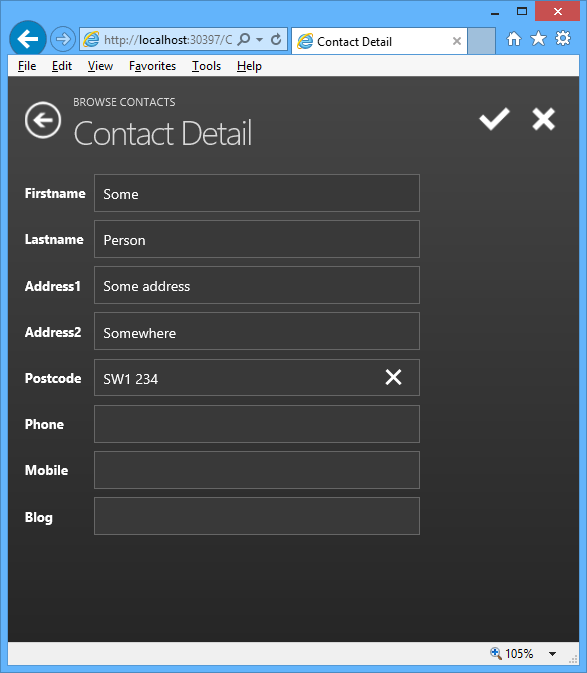 After installing the preview, I built a quick HTML client app, based on a contact database. I also found an annoyance that may be a bug. 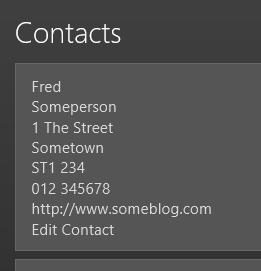 I created several new contacts via a Contact details form (the first illustration above). I saved each contact with the tick button, whereupon they appear in the contact list. However they are not yet really saved. 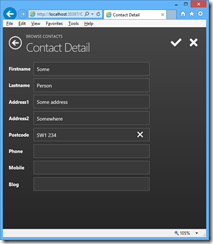 To save the contact to the database, you have to execute the save action, which is a built-in button on the BrowseContacts form. When I tried to save, the phone number fields (defined as Phone Number fields) failed validation, even though they would be valid phone numbers in the UK, and the records were not saved. Fair enough I suppose, but why did they pass validation in the Contact Detail form? I am sure there are easy fixes for all these niggles, but I mention them to illustrate the point about this not being the most intuitive of tools. The general approach also takes some mental adjustment. Here is a tool that makes web apps, but you cannot use a web design tool to customise the user interface. 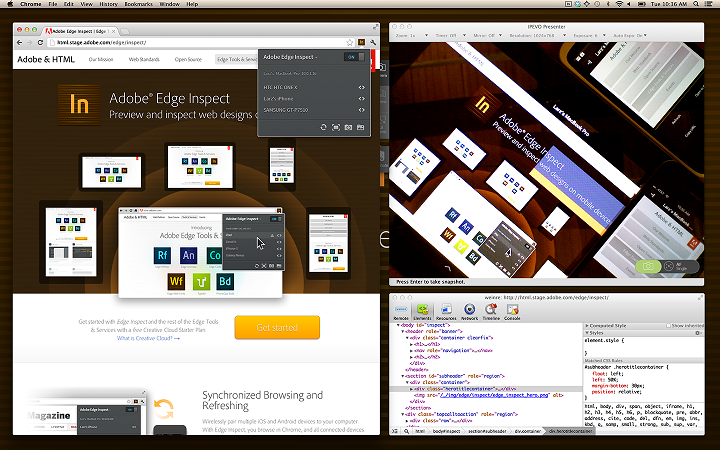 As a tool for building mobile web apps, LightSwitch does show promise and I look forward to the final release. That said, it would be good if Microsoft could adapt the HTML output so you can make it suitable for desktop browsers as well. It is less than a year ago that Adobe pivoted wholeheartedly from Flash to HTML, a moment that to mind was marked by the acquisition of Nitobi, the PhoneGap company, announced at MAX in October 2011. 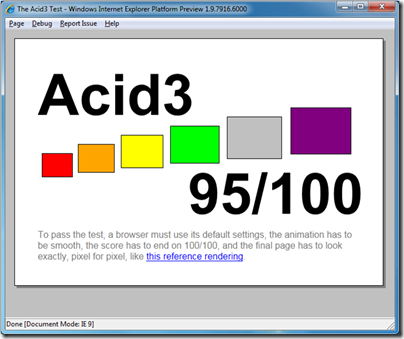 Preview HTML content on mobile devices for test and debug. This is a commercial product based on the open source Brackets project – a similar relationship to the one that exists between Adobe PhoneGap and the open source Cordova project. 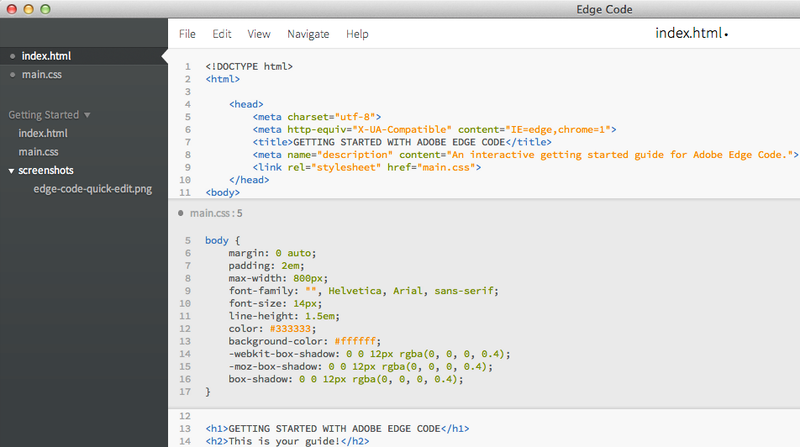 Edge Code adds Adobe integrations such as with Edge web fonts and Typekit, and with PhoneGap Build. 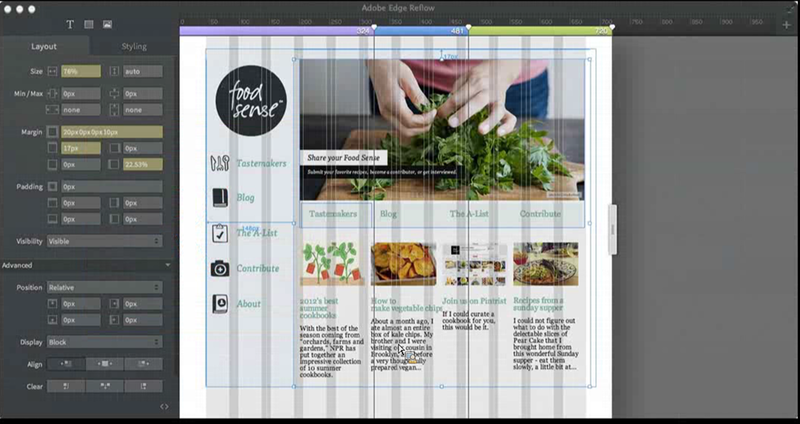 Design tools for CSS, preview expected by end of 2012. Free web font service for open source fonts. Package web apps as native apps for mobile platforms, without needing to install SDKs on your own machine. PhoneGap Build is free for open source apps, or costs $9.99 per month for up to 25 private app builds. The Edge tools are only available through Creative Cloud, Adobe’s subscription service, cementing the company’s move to a subscription model for its products. As a tempter, Edge Animate is currently available even to those with the base, free subscription – though you have to agree to be on a marketing list for email, mail and telephone. Will the Edge tools replace Dreamweaver, the web design tool in Creative Suite? I was told not, and that an update for Dreamweaver is in preparation. 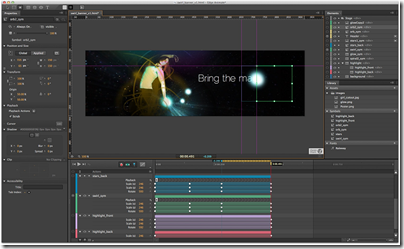 Dreamweaver is the “one production tool” as opposed to the Edge tools each of which focus on one narrow area of features. Adobe describes this as task-focused tools. More information in yesterday’s San Francisco keynote here. The whole post is worth a read, and gives before and after examples. Possible reasons: the Dropbox page has a DOCTYPE of XHTML 1.0, and the files are in .wav format where IE is documented only to support MP3 or MP4. 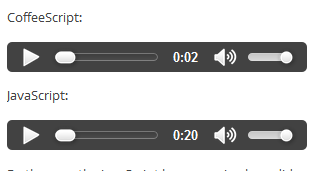 IE10 therefore refuses to play the audio, which works fine in Google Chrome and Mozilla Firefox. The significance of this is not so much the technicalities, but rather what it implies about how many people now use IE in the community most likely to read this post. This is one of those posts that will not interest you unless you have a similar problem. That said, it does illustrate one general truth, that in software problems are often not what they first appear to be, and solving them can be like one of those adventure games where you think your quest is for the magic gem, but when you find the magic gem you discover that you also need the enchanted ring, and so on. Recently I have been troubleshooting a session problem on an ASP.NET application running on a shared host (IIS 7.0). This particular application has a form with some lengthy text fields. Users complete the form and then hit save. The problem: sometimes they would take too long thinking, and when they hit save they would lose their work and be redirected to a login page. It is the kind of thing most of us have experienced once in a while on a discussion forum. The solution seems easy though. Just increase the session timeout. However, this had already been done, but the sessions still seemed to time out too early. Failure one. My next thought was to introduce a workaround, especially as this is a shared host where we cannot control exactly how the server is configured. I set up a simple AJAX script that ran in the background and called a page in the application from time to time, just to keep the session alive. I also had it write a log for each ping, in order to track the behaviour. It turned out though that the session still died. One moment it was alive, next moment gone. Failure two. This pretty much proved that session timeout as such was not the issue. I suspected that the application pool was being recycled – and after checking with the ISP, who checked the event log, this turned out to be the case. Check this post for why this might happen, as well as the discussion here. If the application pool is recycled, then your application restarts, wiping any session values. On a shared host, it might be some else’s badly-behaved application that triggers this. The solution then is to change the way the application stores session variables. ASP.NET has three session modes. The default is InProc, which is fast but not resilient, and for obvious reasons not suitable for apps which run on multiple servers. If you change this to StateServer, then session values are stored by the ASP.NET State Service instead. Note that this service is not running by default, but you can easily enable it, and our helpful ISP arranged this. The third option is to use SQLServer, which is suitable for web farms. Storing session state outside the application process means that it survives pool recycling. Note the small print though. Once you move away from InProc, session variables are serialized, not just held in memory. This means that classes must have the System.Serializable attribute. Note also that objects might emerge from serialization and deserialization a little different from how they went in, if they hold state that is more complex than simple properties. The constructor is not called, for example. Further, some properties cannot sensibly be serialized. See this article for more information, and why you might need to do custom serialization for some classes. After tweaking the application to work with the State Service though, the outcome was depressing. The session still died. Failure three. Why might a session die when the pool recycles, even if you are not using InProc mode? The answer seems to be that the new pool generates a new machine key by default. The machine key is used to encrypt and decrypt the session values, so if the key changes, your existing session values are invalid. The solution was to specify the machine key in web.config. See here for how to configure the machine key. Everything worked. Success at last. Adobe has released a preview of the Illustrator CSS5 HTML5 Pack. 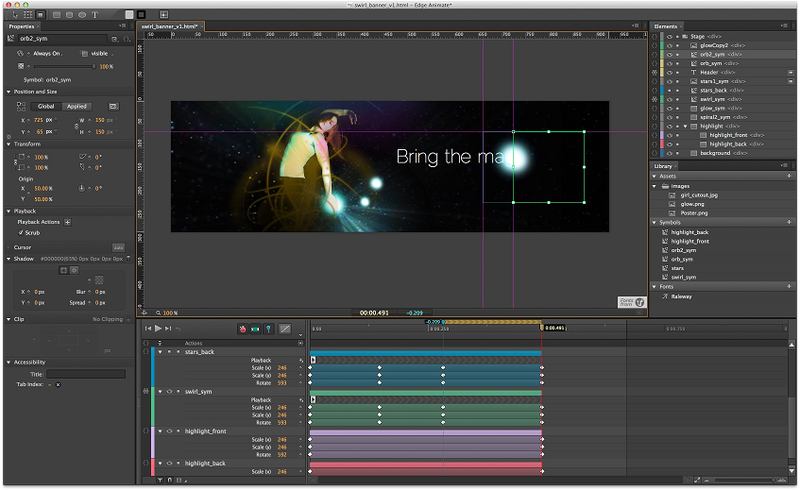 There is already an HTML 5 Pack for Dreamweaver. 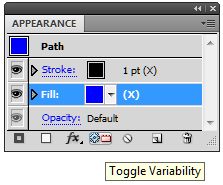 Illustrator CS5 could already export in SVG (Scalable Vector Graphics) format, but the pack adds some interesting features. 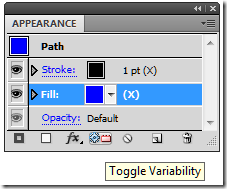 You can also mark an Illustrator object as Canvas. This will convert the object to a bitmap that is drawn to a Canvas element within SVG. There is also increased support for CSS (Cascading Style Sheets). You can use CSS to define fills, strokes, opacity, gradient, position, and named character styles. 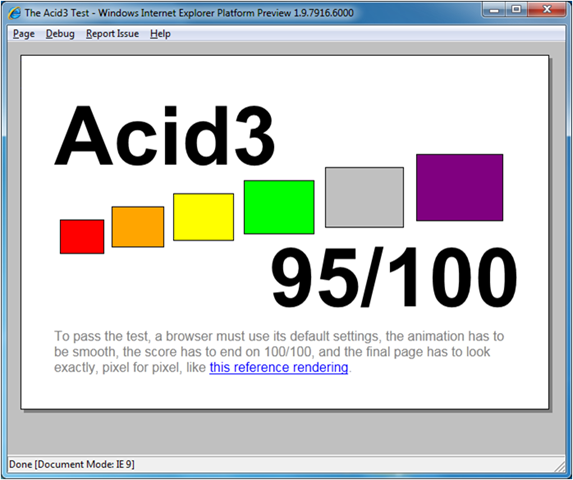 Other features in the Pack include the ability to detect the HTML window size and vary the SVG that is delivered accordingly – to support mobile browsers. 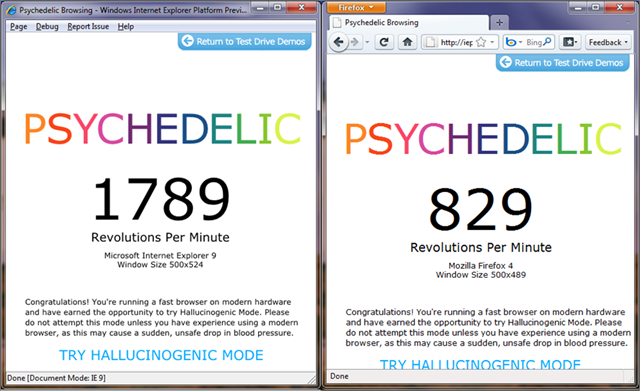 Of course Adobe was doing this anyway, but it is interesting to see HTML 5 support now being extended. Export more HTML 5 goodness at the forthcoming MAX conference next month. If you try the new HTML5 Pack read the installation instructions carefully. You have to back up certain files, otherwise it may affect whether you can apply future official updates.